NASA's new astronaut class: call them the "Chumps"
— Since reporting to the Johnson Space Center in mid-August to begin training, NASA's nine new astronaut candidates and five international trainees from Canada and Japan have been referred to collectively as either the 2009 class of astronaut candidates ("ascans") or NASA's 20th group of trainees. As of earlier this month though, the 14 can be called the "Chumps". "We learned about the class name at a party hosted in our honor by the class of 2004 on Saturday, October 3," explained fellow "Chump" Mark Vande Hei in an e-mail to collectSPACE while he and his classmates were away in Florida for water survival training. Following a tradition that dates back a couple of decades, the incoming astronauts' were nicknamed by the previous class, in this case Group 19 or the "Peacocks." This time however, the 2009 ascans thought they could steer the selection by decorating their office and generally campaigning for their self-chosen name, the "Chimps". "[2004 astronaut] Shane Kimbrough first talked about how the Peacocks had come up with many naming ideas for our class, but commended us for doing such a great job lobbying to be called the 'Chimps'. Instead they flipped over a placard that said 'Chumps'. It was hilarious!" wrote Vande Hei. In addition to Vande Hei, the Chumps are Serena Aunon, Jeannette Epps, Jack Fischer, Michael Hopkins, Kjell Lindgren, Kate Rubins, Scott Tingle, Reid Wiseman; from Canada: Jeremy Hansen and David Saint-Jacques; and Norishige Kanai, Takuya Onishi and Kimiya Yui of Japan. According to Vande Hei, the 2004 Peacocks provided no further explanation behind the name, other than its close spelling to "chimps". The first group of ascans chosen in 1978 to fly the space shuttle were known simply as the "TFNG" — "Thirty-Five New Guys". The Hairballs emerged from another tradition, designing a class patch. 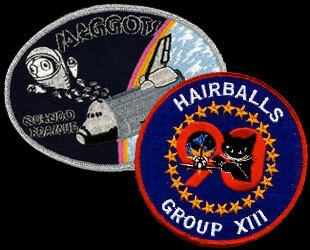 NASA's 13th group of candidates, the 1990 class included an "unlucky" black cat on their emblem. "Someone mentioned that [the patch] reminded them of hairballs and we began to call ourselves that. Since then, every astronaut class has consistently had some kind of disparaging nickname," said Hairball Rick Searfoss in a 2001 interview. The first class to have their name handed to them were the 24 members of the 1992 "Hogs". "Since our class was one of the largest astronaut classes [up to then] selected, the more senior astronauts thought it meant that we would be hogging much of the T-38 flying time, simulator training, and, eventually, space shuttle seats," wrote astronaut Jerry Linenger in his 1999 book "Off the Planet". "At first, I was rather displeased at being called a hog," continued Linenger. "But I figured that we were let off easy after learning that astronauts candidates before us were referred to as 'Hairballs' and 'Maggots'." The largest class to date was the 44 candidates chosen in 1996. "The Sardines... there were so many of us," Mike Fincke recounted to collectSPACE. "It is always interesting to see how [the nicknames] work out. There were classes named after pigs, there were classes that called themselves the 'Escargot,' instead of slugs. Dodos became 'Penguins,' and I guess chimps become 'Chumps'," described Fincke. "It is all meant in the absolute best camaraderie." Though the nicknames are almost entirely for internal use by the astronauts themselves, they sometimes slip into the public forum. Sometimes that happens in space. During the most recent space shuttle mission, four of the 2000 class astronauts posed for a photo together holding their group's patch. Nicole Stott, who is still in space aboard the International Space Station, was one of the four. 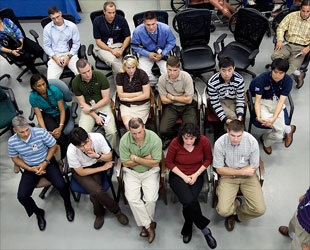 Before launching, she used her blog on NASA's website to share another 2000 class photo. "Our class name is "the Bugz", she wrote, noting that the name has several origins including "year 2000 and the millennium bug", "bugs actually fly", and "it's better than maggots". 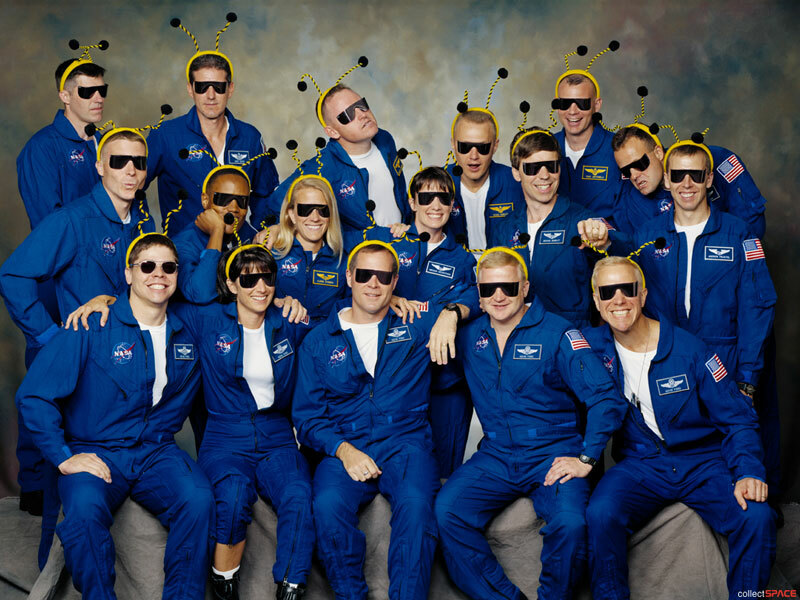 The photo accompanying Stott's blog post showed the 17 member class all wearing yellow and black bug antennae headbands. 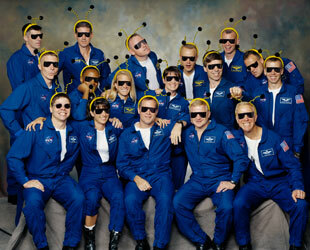 "The picture... was taken at the same time as our official class photo — this is the fun shot," wrote Stott. Though their official photo, let alone a gag one has yet to be released by NASA, Vande Hei said that the Chumps posed for a similar fun shot. "We posed with bananas," he described. But if they are the Chumps and not the chimps, how does that reflect the 2009 class? "Our mascot is Chump the Chimp," explained Vande Hei.